Why have a Drain Survey? A1 Drains are a Dublin based drainage company who carry out many CCTV drain surveys in Dublin every day. CCTV drain surveys can answer so many of your drainage problem questions. Over time, drains can deteriorate, fracture and eventually collapse if they are not maintained correctly. Deterioration of a main drain may take several years and is a result of a number of factors such as ground movement, poor construction and even tree root penetration. First indications of a major drain problem quite often materialise as frequent and excessive blockages. We have a range of options which can survey a main drain line and even pass through a toilet pan to determine the source of a problem when you experience repeated drain blockages. 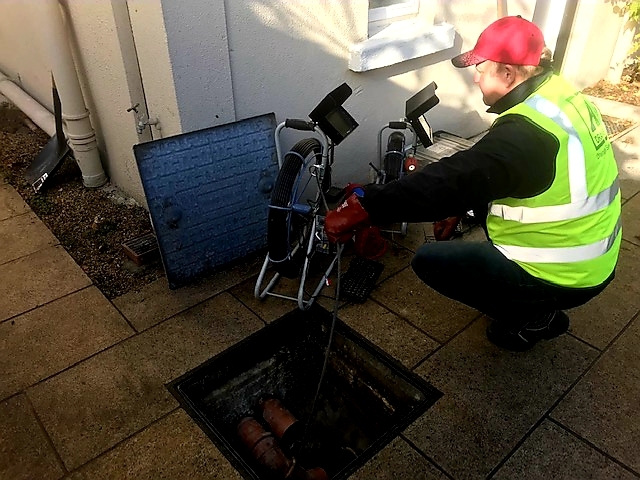 We can carry out a CCTV drain survey to either determine the condition of the drainage system or to assist the engineers to clear a blocked drain. Following on from the drain survey, we can provide estimates for any remedial drain repair work needed. This could include the excavation or relining of the drain if necessary, or to carry out a deep clean or a drain de-scale. The cctv drain camera system can be used to carry out drain inspections of the internal down pipes or soil stacks to help trace cracks or defects in the drainage system which could eventually cause leaks or further drain blockages. We offer a full Home Buyers Drain Survey service. These drain surveys are often required by mortgage companies and insurers alike. Find out the benefits this type of survey offers new home owners and why you should get one on our Home Buyers Drain Survey page. This is a short video of surveying a drain in Dublin looking for any signs of blockages or cracks in the soil pipework.